Alienware, Dell’s high-performance, PC gaming brand, invites customers to join in the ultimate gaming experience with the Alienware X51 its smallest gaming desktop ever with outsized performance capabilities. The latest in Dell’s PC gaming portfolio, the X51 is designed to deliver an exhilarating 1080p high definition and 3D gaming experience of today’s top-tier game titles while the new, smaller chassis design offers the flexibility to turn nearly any living space, from the living room to the dorm room, into an entertainment and gaming mecca. The Alienware X51 gives customers the freedom to focus on the game with the performance expected in an Alienware gaming PC and a thoughtful design for post-purchase upgrades, and the latest in performance technology. The versatile design of the X51 enables customers to achieve high performance computing in virtually any living space with a dual-orientation chassis supporting 7.1 surround-sound audio and an optional Blu-Ray disc drive. “The Alienware X51 allows us to bring the exciting nature of high-definition, immersive gaming within reach of more gamers than ever before. With the X51, we’ve expanded our gaming desktop offering to cater to all gamers in addition to our core enthusiast and competitive gamers. Now everyone can enjoy the latest games on a sleek, powerful, compact and customizable system. The X51 desktop delivers an incredible feature set for its size and price.” said Mr. P. Krishnakumar, Executive Director, Marketing – Consumer and SMB, Dell India and Mobility APJ. “Alienware understands that gamers crave NVIDIA GeForce graphics. That’s why the X51 has GeForce at its heart, combining design innovation with cutting-edge technology to deliver one devastating gaming package. With this desktop, Dell and NVIDIA have set a stellar new standard for stylish small form factor systems,” said Mr. Vishal Dhupar, Managing Director, NVIDIA, South Asia. Alienware X51 features powerful 2nd generation Intel Core i processors, NVIDIA GeForce GT or optional GTX class graphics cards for intense gaming performance, Wireless-N technology for easy Internet access, HDMI 1.4 for connecting to 3D TVs and watching 3D Blu-ray moviesii, two SuperSpeed USB 3.0 ports for fast data transfer, High-Definition 7.1 Performance Audio and GDDR5 graphics memory – the most advanced graphics memory offering available. 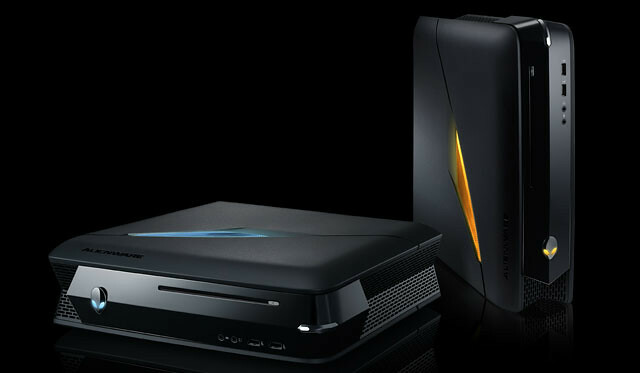 The Alienware X51’s intelligently designed chassis blends function and style. The desktop’s sleek matte black finish with dark chrome accents and three customizable lighting zones, controlled by AlienFX® software, create a distinguished appearance. The gaming desktop’s thoughtful design with an ultra-quiet dual orientation chassis allows for a horizontal or vertical set-up, allowing flexibility in the X51’s footprint without sacrificing performance. The intuitive internal layout with a mini-ITX motherboard allows customers to perform their own hard drive, graphics card and memory upgrades quickly and easily, giving them peace of mind for the system’s longevity. All Alienware laptops and desktops come with Alienware Command Center, which provides intuitive, user?friendly access to exclusive applications and controls, including AlienFXTM lighting effects and the AlienFusion power management system. AlienAdrenaline, a new module for the Alienware X51, enables gamers to create unique profiles that launch a series of customizable events when activated, such as opening specific programs, changing AlienFX themes, opening key web links and more. Updates and new releases download directly into Command Center, creating a constantly evolving tool for users to modify and personalize their system. India: Alienware X51 is available now Alienware.co.in and will be available at the Alienware and Dell Exclusive Stores at a starting price of Rs. 49,990/-. Alienware Gaming Services is available in India at this time. U.S: The Alienware X51 starts at $699 which includes - Intel® Core™ i3-2120 3.3GHz (3MB Cache), 4GB Dual Channel DDR3 RAM, 1GB GDDR5 NVIDIA® GeForce® GT 545 and 1 TB SATA HD.